One candle will be dressed, blessed and lit on your behalf on his feast day of JANUARY 6th. Offerings will be preapred and an altar set for this holy day. *** YOU MUST TYPE YOUR PETITION ON YOUR ORDER FORM IN THE "SPECIAL INSTRUCTIONS" AREA!!! I WILL NOT ACCEPT SEPARATE OR LATE PETITIONS. 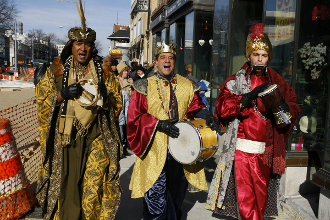 Regardless of faith, most Americans know the story, or at least, know of the story, of the Three Kings. As my venerable colleague and About Christianity Guide, Mary Fairchild, explains, we don't know a whole lot about the Magi (which doesn't mean magic-trick magicians but rather a general term for astrologers, seers, and fortunetellers). In their sole appearance in the Gospel of Matthew, they are never named, and hail from "the east." (The names we have come to know them by -- Gaspar, Melchior, and Balthasar -- were handed to them much later on.) The most well-known thing about them, of course, is that they came bearing gifts: gold, frankincense, and myrrh. On the night Christ was born, the were drawn by a "mysterious light" which became a star that hung in the western sky. The followed this sign to Bethlehem, where they arrived (a little late) to honor Christ's birth. In fact, the "12 Days of Christmas," which is so often believed to end on December 25, actually begins on the 25th and runs through January 6, culminating with the Feast of Epiphany, or "The Adoration of the Magi."